You might just be named parent of the year by your kids this month when they realize you’re not trying to coerce them into eating boring and bland “healthy” food. Your kids will love these yummy treats and you’ll be pleased to know they’re getting the fiber they need to be healthy and strong. So here are 5 high fiber snacks your family will love #WayToGoMom. This crunchy treat feels like your classic potato chip, but is oh-so-much-more nutritious! With approximately 3 grams of fiber and only 50 calories per serving, if you snack often, this is a good choice for you. For a Cheesy treat see our Kale Recipe here! A modern twist to your classic banana and peanut butter. This savory delight lets those who suffer from a peanut allergy enjoy a worry- free snack. You’ll get approximately 7 grams of fiber, plus a nice dose of potassium; an essential nutrient for your heart, kidneys, and other organs. Berries of all kinds are in season now and are sweeter than ever! Combine all your favorites like blueberries, raspberries, blackberries, strawberries, and cherries for a sweet treat the whole family will love. For every cup of mix berries, you’ll see about 4-8 grams. These tiny beans are big on fiber! Red or brown varieties have between 5-6 grams per serving. They’re also a breeze to cook. If you love your crock-pot, bake these little beans on low for 4 hours with your favorite chopped veggies like carrots, celery, or tomatoes. 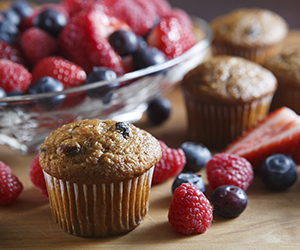 If you love your morning treat with your coffee, opt for a bran muffin. This will pump you full of 5 grams of fiber, which will keep you feeling full all morning long. We have to give honorable mentions to some other high fiber treats too. Dried figs (aka prunes) provide a whopping 10 grams of fiber per serving. Whole wheat noodles give you 5-6 grams of fiber, perfect for your family spaghetti night! And split peas are your might green giants with up to 13 grams when cooked. Whichever treat you choose, nosh your way to a full and fit lifestyle with these high fiber snacks.